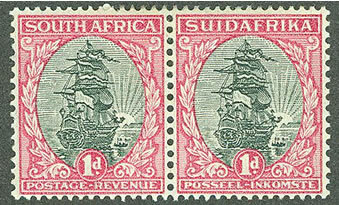 The South Africa KGV pictorial issues were printed in two locations: London (Typography - better quality impression) and Pretoria (Rotogravure - coarser impression). 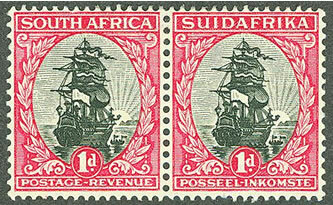 Sorting the stamps is done by determining the difference between the London and Pretoria printings. This article is intended to show a collector how to figure them out. 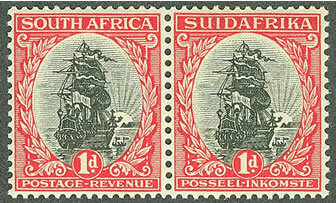 The catalog numbers are from the 2011 Stanley Gibbons Stamp Catalogue (SG) and the 2011 Scott catalog (ST). The images were saved in a larger size and at a higher resolution so you can more easily see the details used in sorting them. They are arranged on top of each other to allow comparison between the printings. Please be patient if it takes a few minutes for this page to load. Please note - the scope of this web page is to identify the basic issues as described in the major catalogs. Tthere are additional color and perforation varieties to this issue. They have been left out in order to simplify the sorting process. 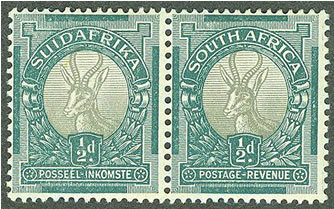 Also, the original issues of the 1/2d, 1d, and 6d values were printed in both London and Pretoria using the same plates. For purposes of this site, we refer to both of them as London Printings. 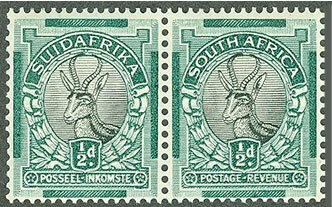 Please consult the South African Stamp Colour Catalogue for more detailed lisings. 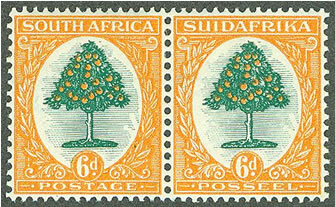 The small format pictorial stamps, 1/2d, 1d and 6d were initially typograph printed by Waterlow & Sons in London, later in Pretoria using the same plates and additional plates ordered by the Govt. Printer in Pretoria. After 1929 these were printed by Rotogravure or sometimes also known as photogravure. The rectangular issues, 2d, 3d, 4d, 1/-, 2/6, 5/- and 10/- were recess not typograph, printed by Bradbury Wilkinson & Co in London. Later they were redrawn and printed Rotogravure in Pretoria. Web Site with Larger Sized scans - will allow you to more clearly see the differences between printings for these stamps. Notice how the leg of the R is shaped in each printing. The The leg is longer and more curved in the London Printing, and shorter and straighter in the Pretoria Printing. 1948 economy printing to use up old stock of paper. Notice the Rose color and Greyish center compared to SG 43. 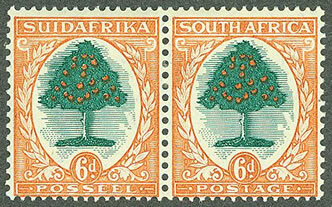 Notice that there is a statue to the left of the 2d in the Pretoria Printing. Also, there is a significant color difference between the two stamps. Notice the lines and shading at the top of the design. The London printing has more shading than the Pretoria printing. Notice the scrollwork to the right of Posseel or Postage. There is more shading in the London Printing than the first Pretoria Printing. Notice how the scrollwork is now differently shaped than the previous two issues on this printing. You will find a number of shades ranging from light brown to a deeper brown for this printing. Notice the flowers around the frame. They are very well defined with more detail in the London Printing, and less defined in the Pretoria Printing. You should also notice how well defined the frame around SUIDAFRIKA and SOUTH AFRICA are in the London Printing compared to the Pretoria Printing. Notice the difference in color between SG 48 and SG 48AW. You will also see that the watermark is inverted in this issue. Notice the area around SUIDAFRIKA. It is much better defined and with less gaps in the London Printing than what you will see in the Pretoria Printings. Also, if you observe the identification chart used by the Gibbons catalogue, it is the author's opinion that they have switched the 2/6 images. The one shown under Typo really belongs under Roto, and vice versa. You can prove this by looking at SG49b (the stamp with the blue center). There was no Pretoria engraved plate for either of these two issues. 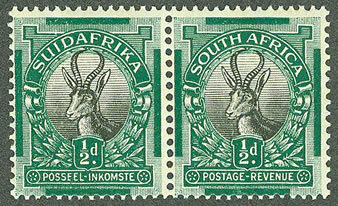 South Africa Official Stamps for sale based on the identification from this article.